Present Tense are Richard Frank (acoustic bass) and Ronnie Kaufman (drums/percussion). Ronnie Kaufman is well known as the drummer of the GAP Band on their albums The GAP Band II - V. He also played with Mary Floyd, the Charles May ensemble, Marvin R. Yates, Michael Evans, Lonnie Simmons, Robert Whitfield and a lot more. Their first collaboration was in the group "Zen Dadio". Ronnie was playing on some gigs of this group. Soon after Ronnie and Richard formed together with Chad Edwards (keyboards) a jazz trio called "Tryangle". After their trio sessions they added a sax man on some gigs around Southern California. So they created a new name for the group: "Present Tense". Presently the group is a quartet with Mike Telesmanick on keyboards and Al "Poncho" Williams on sax as the live formation. On their album "Night Shadows" are playing Richard Frank, Ronnie Kaufman and Chad Edwards. Another session cat joined the band: John Enrico Douglas is playing Steinway piano and Korg Triton on tracks 1-5. All tracks of the album were recorded live except percussion. All tracks were written by Richard Frank and/or Ronnie Kaufman. The CD is trio based - piano, acoustic bass and drums (plus added percussion). The albums starts with The Approach. The tune has a grooving and floating structure. Bass and drums/percussion are running as basic background while John Enrico Douglas is playing the melody in an accentuated way. I can only repeat the right word as a description:" Audience-accessible" and would like to add "Hooking". Pinstripe is another interaction of these three instruments with a high improvisation potential, which will be expended especially in live performances. This is definitely a promise of the group they will keep. 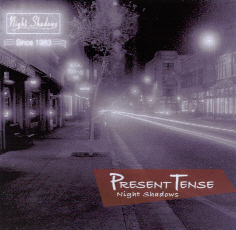 The title piece Night Shadows is a smooth slow ballad. This song was worked out over several days. If you love the piano play, try John Enrico Douglas' artistry on this instrument. The bass line of The Ride was originally written by Richard on the piano. The piano leaded melody is deeply involved in the bass line and a constantly responding or interaction to it. The intriguing Latin rhythms of Dia Del Sol are the best platform for Ronnie Kaufman's professional skills in drums and percussion and Douglas added his propulsive piano. Cracker was named after a friend of Richard's who was checking people in the boards and often getting rowdy. Richard gave him the nick-name "Cracker". Chad Edwards plays the theme on his keyboards (Kurzweil PC88 and Korg T3). Nightfall was created through an interplay between Richard and Ronnie late at night. The tune has a swinging character. You know what an Outhouse is? Read about Richard's experience with this institution in the liner notes of the album. The tune is walking on the jazz side. Sweet And Simple is the name of the following bluesy short piece. Wrath may be the congenial continuation. The melody is plain and I understand it as the starting point for further improvisations. Give An Inch was named by Richard's wife and she adds to the title "...but she'll take a mile". The last session piece Overload was dedicated by Ronnie as a tribute to his mentors, teachers and all know jazz greats. The tune has a swinging attitude and one can observe the players have fun with these modal changing. "Night Shadows" was made by artists first for themselves. It's not a commercial album "The Approach" excluded. Friends of jazz sessions will like the live atmosphere of Present Tense's debut.